Our product range includes a wide range of bod incubators. 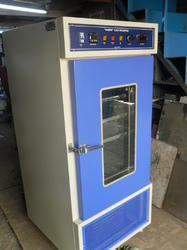 We are a manufacturer, supplier & dealer of B.O.D Incubators. We are the stalwarts in offering B.O.D Incubators to our clients at market leading prices. This range of B.O.D Incubators is applicable in hospitals for infants. The offered range meet the requirement of patrons related to the bio oxygen. These incubators are offered in different forms, in accordance with the specifications detailed by the patrons.